Research Triangle Park, NC – The United States Agency for International Development (USAID) has selected RTI International to implement a five-year initiative to strengthen and improve access to critical health services for Filipino families. Beginning later this year, the Family Planning / Maternal & Neonatal Health Innovations and Capacity Building Platform (ReachHealth) will help Philippine communities reduce unmet needs for family planning services and decrease teen pregnancy and newborn morbidity and mortality. ReachHealth responds to unmet family planning needs in the Philippines, which has led to high levels of teenage pregnancy and newborn morbidity and mortality. To address these challenges, ReachHealth will improve individual, household and community knowledge of family planning and maternal and neonatal health (FP/MNH); increase access to comprehensive quality care, including lifesaving newborn care, and increase the capacity of providers to deliver this care; and strengthen health systems supply, logistics, budgeting, and functionality across governance, finance, human resources, and data. It will also increase demand for FP/MNH services and transform gender norms. Partnering with RTI on ReachHealth are the Johns Hopkins Center for Communications Programs and Duke University Global Health Innovation Center. 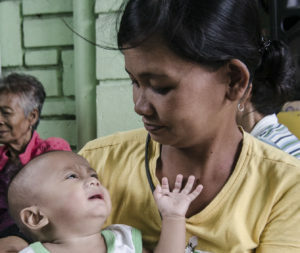 The team will support Philippine counterparts—primarily the Department of Health, Commission on Population, Philippine Health Insurance Corporation, civil society, and the private sector—to identify and respond to local root causes of poor FP/MNH outcomes. The team’s approach prioritizes relationships with government stakeholders to bolster efforts to address cultural, systemic, and institutional challenges and move toward self-reliance. The approach also maintains a concerted focus on disadvantaged women, adolescents, and the most underserved. Project implementation will begin in December 2018 and conclude in November 2023. The geographic scope will focus on urban, rural, and remote areas, as well as geographically isolated and disadvantaged areas. Building strong health systems is an important catalyst in the Philippines’ journey to self-reliance. ReachHealth builds on previous USAID investments to strengthen health systems and improve health outcomes for Filipino families, including the RTI-led LuzonHealth project. Under LuzonHealth, individuals using family planning increased from 1.5 million (66%) in 2013 to 2.1 million (68%) in 2017. Further, newborn deliveries attended by skilled birth attendants increased from 57.8% in 2013 to 75% from October 2015-September 2016. RTI also brings more than 30 years of experience in the Philippines across sectors including health, education, environment, governance and workforce development. To learn more about RTI’s global health work, please click here.